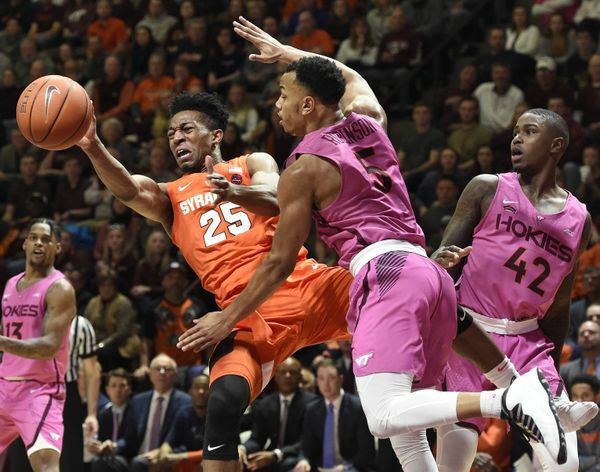 Syracuse raced out to a 5-1 start to ACC play. All previous shortcomings seemed forgiven, especially with a colossal Duke upset as a part of the fold. But the weekend’s embarrassment against No. 10 Virginia Tech represents a shift in the schedule for the remainder of league play. Don’t get me wrong, winning five of your first seven games in conference is no small feat. Especially in the ACC. It was especially imperative for an Orange team that racked up an uncharacteristic four non-conference losses. However, four of those five wins came against four of the five worst teams in the conference standings. The schedule gets much tougher for the Orange in multiple ways down the road. For starters, the majority of Syracuse’s remaining schedule is on the road. If you include the Virginia Tech loss, seven of the Orange’s final 12 games are away from the Dome. SU currently sits in the middle of a stretch of three straight road games in eight days. That can certainly wear down a team that just got shot out of the gym on Saturday. Road disadvantage aside, the Orange still has to play the top four teams in the conference. The toughest part may be that three of those four games come at home against heavily motivated teams. Duke, of course, wants to avenge the earlier loss this season. Louisville is tired of being counted out after undergoing a coaching change in the offseason. And Virginia is taking no prisoners this season after an underwhelming tournament performance last year. Taking all of this into account, you can see the final 11 games are no cakewalk. The 5-2 start was great and certainly necessary. But the final stretch are going to be the most crucial for a team that’s still searching for an identity. Boston College and Pitt provide very winnable opportunities, albeit on the road. A 7-2 ACC record should be enough to give this team momentum for the rest of the season. But this two game stretch is the easiest for Syracuse for the rest of the year. That should strike a little fear into Orange fans given that both games are on the road. It’s tough to gauge exactly how many ACC wins will be necessary to get into the tournament. The Orange already has a quality one on the road against Duke, which will certainly give them a leg up over most bubble teams come March. But of course, all of this is moot if the Orange completely handles business or totally flops down the final stretch.